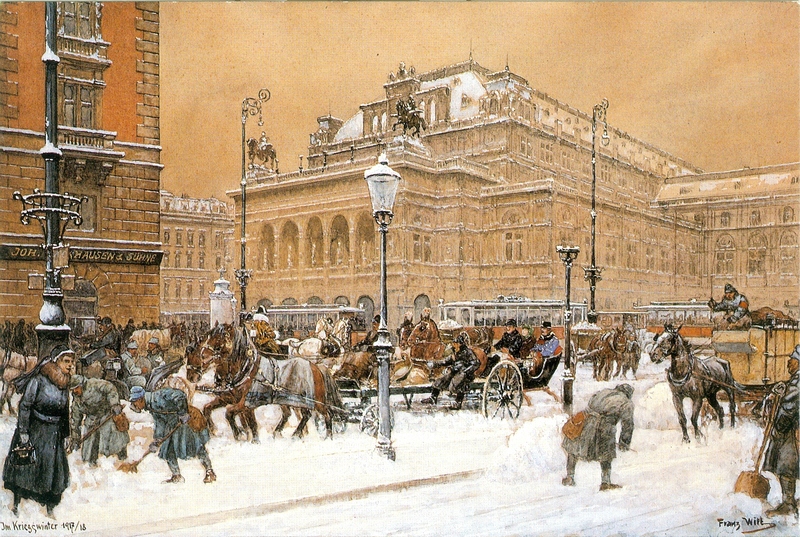 This winter scene shows the heavy traffic on the Opernplatz in Vienna during the Great War. We see all kinds of horse-drawn carriages and commercial vehicles. In the middle a timber bob drawn by two horses with blankets, while the driver sits on the pole, which is destined to transport heavy logs to a sawmill, now without load. Behind this vehicle a sleigh, drawn by a team of two bays, with a coachman and a couple as passengers. On the right a wagon with high boards loaded with something like coal. On the left a cab (Einspänner) with two soldiers and a dog as passengers. A team of two grey horses is visible on the background, probably Lipizzaners. An electric tramway runs along the Opera building. Horses not only occupy the street, but two sculpted horses also dominate the front of the impressive Opera building. On top of the loggia stand two winged horses ridden by the Muses Harmony and Erato, symbols for the arts performed in the building and sculpted by Ernst Julius Hähnel (1876). In this work we see a beautiful combination of the practical value of the horse for transport and the inspirational value of the horse for the arts, even in this war-time city. How many ears has a horse?